Thanks, Amy and Garett for letting us use the car seat! What no pix of your closet TP. No pix the the “system” No pix of T-Shirt without collars, T-shirts with collar, Shirts you don’t wear, short sleeve dress shirts-long sleeve dress shirts- weird jacket category-lots of jeans with holes category-folded shorts, redcanary letters. Why… you don’t think everyone wants to see that. 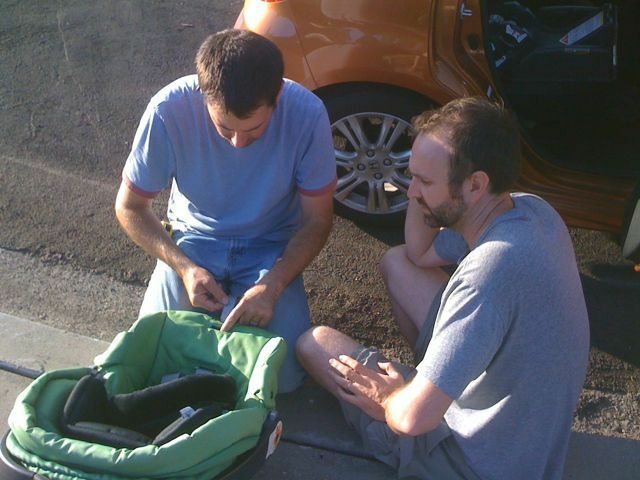 I can’t wait to see TP put that babadoo in this car seat the first time and then lickedysplit pull those straps tight. At least this time I’ll be ready for the daddy way of handling a baby. Andronious scared the begeebies out of me when he put those brand new born little dollies in the car seat for the first time.